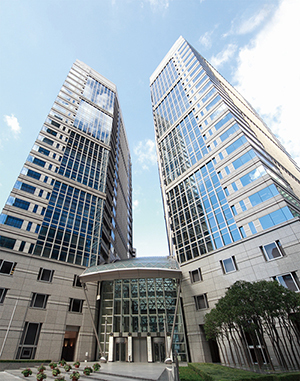 In June 2016, Mizuho Securities planned for all facilities to be replaced due to a floor relocation. It is with the new floor relocation that they installed 1000 new EIZO monitors. 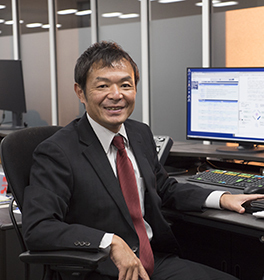 We interviewed the Mizuho Securities’ Deputy Director-General of the Financial Markets Head Department, Mr. Kenjiro Matsuo, regarding the circumstances leading up to the installation and his impressions post-installation. 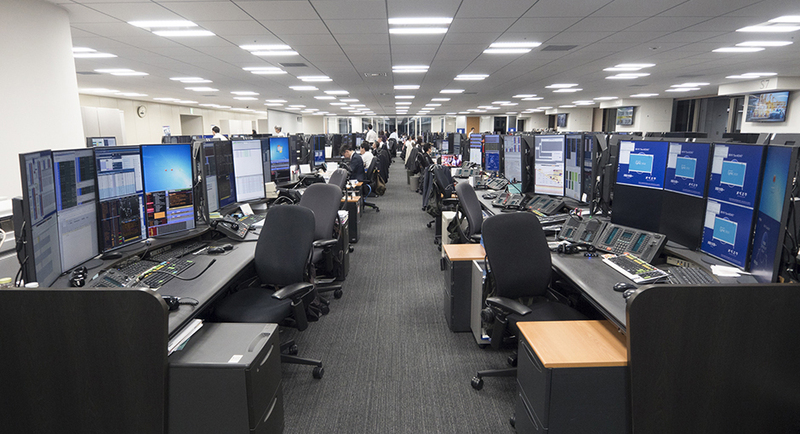 The Global Markets Division’s dealing room, where the EIZO monitors were installed, engages in market-making business practices such as receiving and processing stock orders, bonds, and derivatives for wholesale customers. Due to the nature of our work, we deal with a lot of various information at the one time. Because of this a lot of PCs and monitors are needed, the placement and organization of which has always been a challenge. For example, a terminal used for making orders cannot be used on a PC containing other applications. 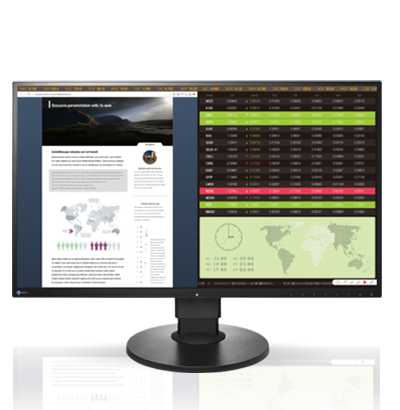 So in order to display orders at the same time as other information, multiple monitors are required, making an efficient layout indispensable. Because eight screens are necessary for most cases, we previously were using eight 19-inch square LCD monitors attached to an arm mount. Some traders required a different numbers of screens, so various arrangements were needed to meet those requirements. 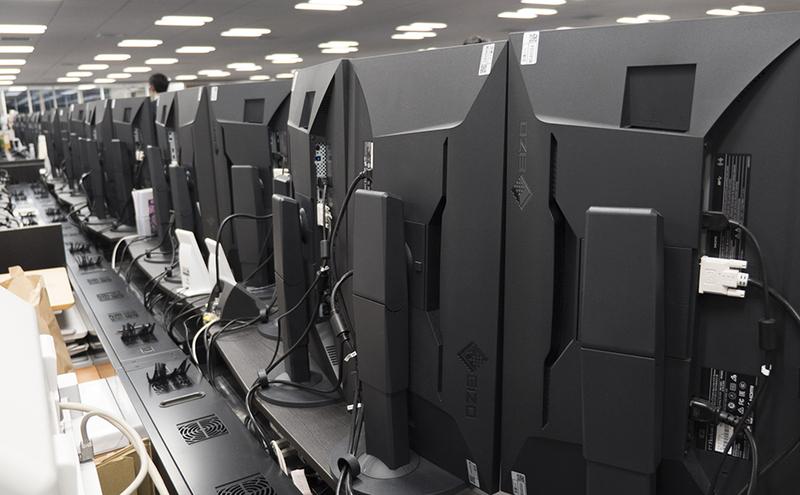 The previously used 19-inch LCD monitors were made by EIZO, so when it came time to renew the facilities, EIZO told me about the FlexScan EV2750 – which at the time had not yet been released to the market. The FlexScan EV2750’s 27-inch screen can be divided into two using the Picture-by-Picture function, which is the equivalent of using two 19-inch monitors. We decided that this would solve a lot of the complications we had in the past and began considering it as an option. With the FlexScan EV2750, the stand height can be adjusted and the monitor rotated. We took advantage of this feature to arrange four monitors side-by-side in portrait position. With the Picture-by-Picture feature we were able to maintain eight separate display areas while only needing four monitors – ultimately turning eight 19-inch monitors into four 27-inch monitors. And by using a dual output compatible video card, we are able to display information across multiple monitors. Thanks to this the freedom of the screen layout has significantly improved, making it easier to fit the various needs of our traders. Additionally, because the bezels of the FlexScan EV2750 are so thin, there is very little space between the screens when arranged side by side, making it easier to move one’s gaze between screens. I believe that this has led to an improvement in work efficiency in the office. 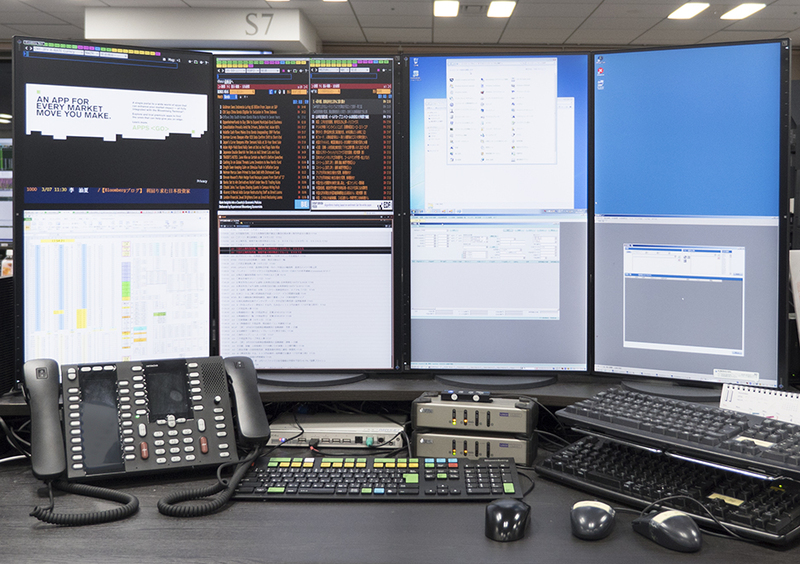 With this manner of monitor arrangement, we were able to create a clean, connected floor space and dealing desks where communication between traders was smoother. Because mounting arms were not required, we were able to reduce costs and labor during installation. In the future we believe it would be great if EIZO could continue to improve the efficiency of the Picture-in-Picture function with an increased number and type of video input terminals.